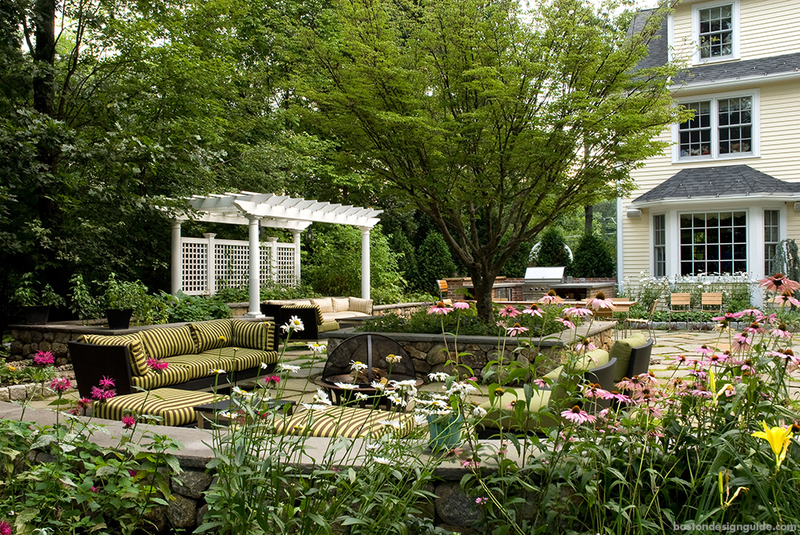 Landscape architect Karen Sebastian of Karen Sebastian, LLC gave a sunny Sudbury home an outdoor environment that rivals the layout of any interior domain. 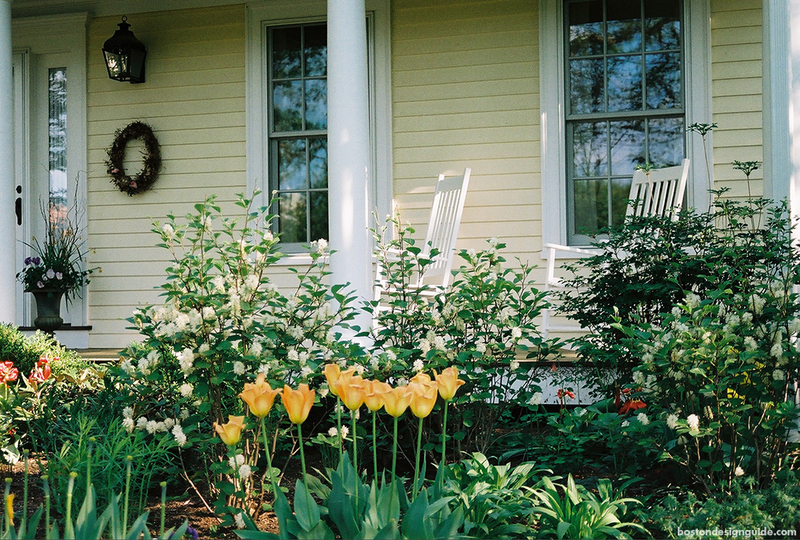 While the front garden greets homeowners and guests with teeming fothergilla and tulips by the porch, the backyard was sculpted into a series of outdoor “rooms” that serve their own purpose yet together meld into a thoughtful, family-friendly oasis. 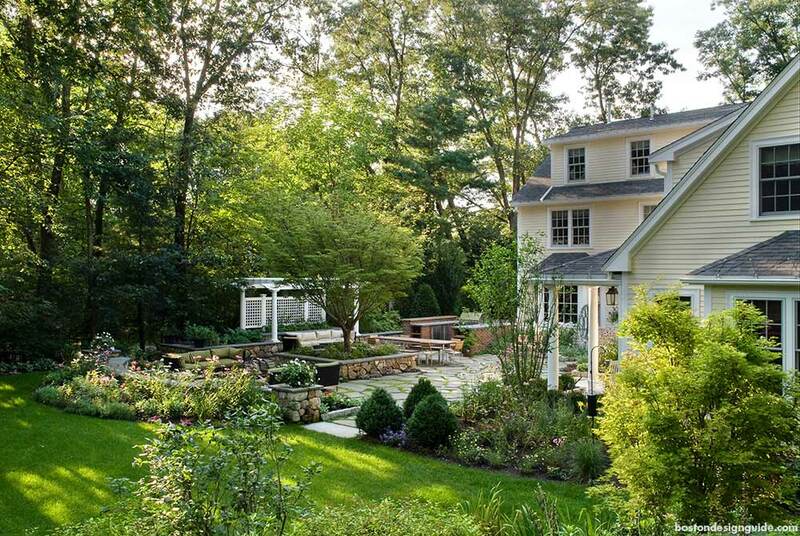 Sebastian carved three distinct spaces—an outdoor kitchen and grill area, a dining area and a “living room”—into an irregular bluestone terrace softened by “stepable” plantings of Mazus and thyme in the joints. The large planter in the middle, home to a statuesque Kousa dogwood, separates the outdoor kitchen area from the living room space. It also provides a leafy lookout from an additional sitting area shaded by a pergola and a canopy of mature trees on the property’s edge. With lanterns overhead and backed by a raised vegetable garden and a trellis with climbing roses, the pergola nook gives homeowners an alternate space to lounge in close proximity to the grill master and to those gathered at the table. Throughout, Sebastian incorporated fieldstone walls with bluestone caps to match the terrace and partition the patio from the open lawn, children’s play area and woodland in the distance. 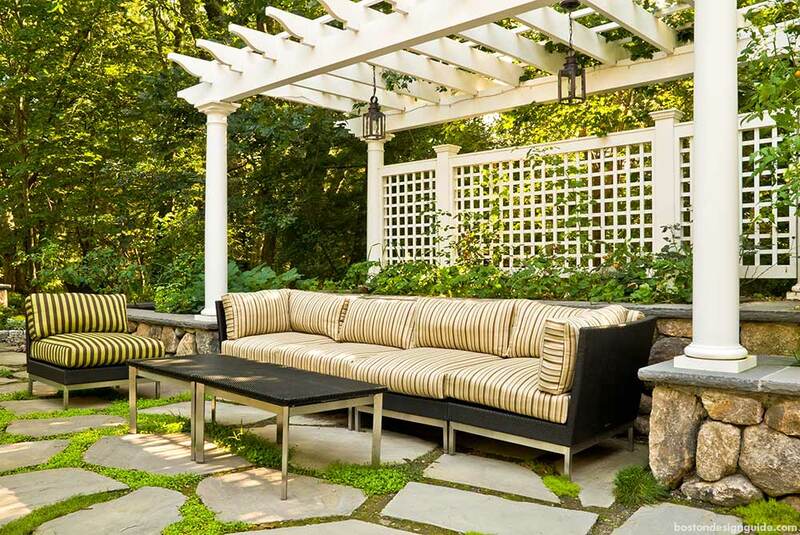 Seat walls along the planter and the curving wall of the living room create “built-in furniture” to accommodate the crowds that convene by the ever-popular fire pit. Sebastian then lined the perch with a bed of perennials that includes hot pink nardo, pale pink Echinacea, Chrysanthemum “Becky” and day lilies.